↑ Chandler, Daniel (10 April 2000). "Marxist Media Theory". Aberystwyth University. Archived from the original on 5 July 2012. Retrieved 22 July 2012. 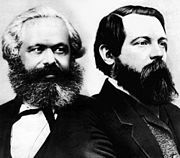 ↑ Engels's letter to J. Bloch; from London to Königsberg, written on September 21, 1890. Historical Materialism (Marx, Engels, Lenin), p. 294 - 296. Published by Progress Publishers, 1972; first published by Der sozialistische Akademiker, Berlin, October 1, 1895. Translated from German. Online version: marxists.org 1999. Transcription/Markup: Brian Baggins. Retrieved December 16, 2017.